The kind of meeting I hate having the most as a high school principal is one with the parent of a student who has just engaged in behavior in the school that warrants, according to our school board policies, a suspension from school for a period of time. In these kinds of meetings parents and guardians ask, rightly so, what good will come of keeping their child out of school where the child will fall further behind his or her peers. They are absolutely right. Over the last decade, my school has worked hard to reduce the number of infractions that lead to an out-of-school suspension and instead incorporate other forms of disciplinary consequences and restorative justice practices. My school has also looked at ways that the number of suspension days can be reduced for infractions that do require an out-of-school suspension. Still, I don't believe our efforts have been enough, and what worries me further is that other schools are even further behind than my school in their understanding of the impact that suspensions can have for groups of students in their schools. This past spring, the National Center for Learning Disabilities (NCLD) in Washington, D.C., released this compelling report. They used recent data and research to spotlight the challenges and opportunities that face the 1 in 5 children who have learning and attention issues like ADHD and dyslexia. In the report, NCLD suggests that "without the right academic or emotional support, they are much more likely than their peers to repeat a grade, get suspended and drop out. Individuals with learning and attention issues also struggle in the workplace and have high rates of involvement with the criminal justice system. But this downward spiral can be prevented." The data does not lie. In the report, NCLD showed that students with disabilities were more than twice as likely to be suspended as students without disabilities. The breakdown of suspensions by ethnicity is even more alarming, with African-American/black students suspended 2.5 times as often as white students. This problem compounds on itself. Suspensions lead to significant loss of instructional time, which in turn creates a high risk for students to drop out. As NCLD suggests in their report, "over 1 million students with IEPs miss three or more weeks of school a year." This represents 19 percent of all students with IEPs. It should come as no surprise, then, that according to the NCLD report, "the dropout rate for students with learning disabilities is nearly three times the rate for all students." In reflecting on this trend and the relevance of the NCLD report, Understood.org editor and blogger Andrew Lee stated, "This is important to note because students with ADHD struggle with impulse control. They have trouble regulating their behavior." Lee suggests that many suspensions happen for nonviolent offenses. 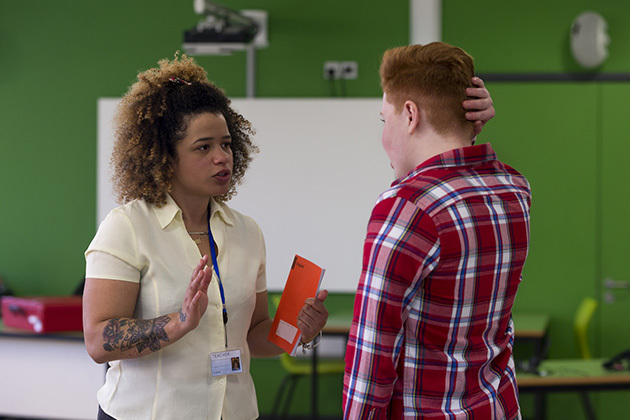 Consider, for example, this six-year Texas study that followed more than 600,000 students to conclude that 97 percent of students were disciplined for "discretionary" offenses that involved disrespect and disruptive behavior. The report went on to suggest that of students who got suspended just once, only a fraction (less than 1 in 12) had a learning disability. Yet, for students who were suspended 11 or more times, that rate increased to 1 in 6 who had learning disabilities. Schools should look for ways to increase the use of social/emotional learning and mindfulness training for all students and staff. In this 2014 MultiBriefs Exclusive article, I lobbied for the importance of grit on a positive school culture. According to NCLD, grit, resilience and a "growth mindset" — the belief that a child's ability and intelligence can be improved by working hard and not giving up — are at the forefront of many education policy discussions as new research points to social and emotional skills as a core element of student success. Later, in this 2017 MultiBriefs Exclusive piece, I outlined a series of resources as well as plans that educators could incorporate to infuse mindfulness in their schools. Recently, the U.S. Department of Education issued "Equity in IDEA" regulations that are designed to help schools address disparities in the use of discipline for students with disabilities. Regulations include assisting in how schools classify groups of students, helping schools identify the root cause of their disparities, and allowing districts more flexibility in how they use funding to address these disparities. Attendance: Chronic absenteeism can be a sign of learning and attention issues or of other issues that are distracting students or making them not want to go to school. Behavior incidents: Students who get suspended even once in sixth grade are less likely to graduate on time. Course work: Low grades could be a sign of unidentified or inadequately supported learning and attention issues, disengagement with school or a combination of these. Students with disabilities are counting on us as educators to figure this out. We need to be sure that schools are meeting the needs of all learners, particularly those who may struggle due to a disability or some other barrier to learning such as language or socioeconomic status. We cannot continue to operate our schools the way we have, because we are not doing right by our students in our efforts to ensure to each of them a free and appropriate education that meets their needs and helps them reach their potential in life.